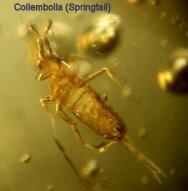 The Collembola (commonly referred to as springtails) are belived to form a monophyletic group i.e. they evolved from a single common ancestor during the Devonian. Not only does insect group Collembolla comprise some of the most primitive insects, but their direct ancestor may have been among the first arthropods to transition from a marine environment to land. The oldest fossil Collembolan, Rhyniella praecursor was taken from Lower Devonian beds of the Rhynie chert in England. 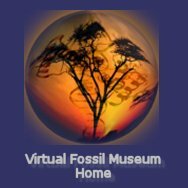 In spite of the early occrence, the fossil record has no trace of Collembola between the Devonian and the Cretaceous, and even after that the record is very sparse. Most fossil springtails have been described form fossil amber, and with very few exceptions respresent extant genera. Collembola are distiguished by a special tube on the ventral side of the first abdominal segment that apparently evolved for fluid exchange; Collembola, derives from the Greek words 'cole', meaning glue, and 'embolon', meaning piston. The tube is a 'glue piston' because some Collembola use it for adhering to smooth surfaces.